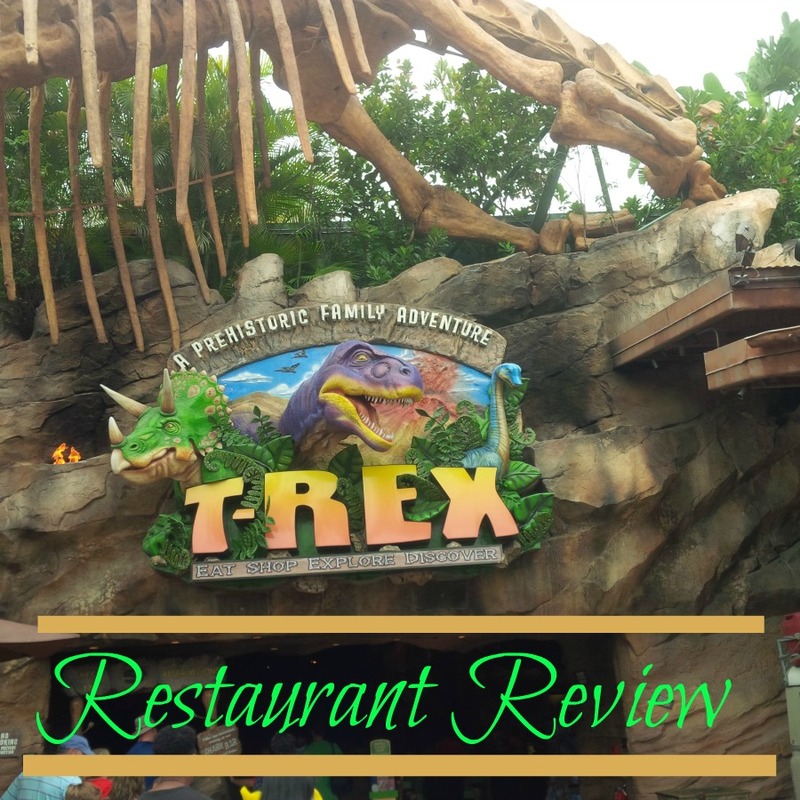 When we visited Florida earlier this month, we dined at Rain Forest Cafe (which is one of my favorites) and while we were there we earned reward points with our Landry's Select card towards a future meal. The catch was that we had to use the rewards points during the current month. Instead of returning to the Rain Forest, we decided to try T-Rex Cafe. I was never interested in visiting this place because I remembered the menu being a lot of barbecued meats such as ribs and stuff. This was something that did not really interest me but was willing to give it a try since we had reward points to use. We arrived shortly after 11:30 am and the lunch rush had not really hit yet. We were asked to wait a few minutes for our table which was no problem. 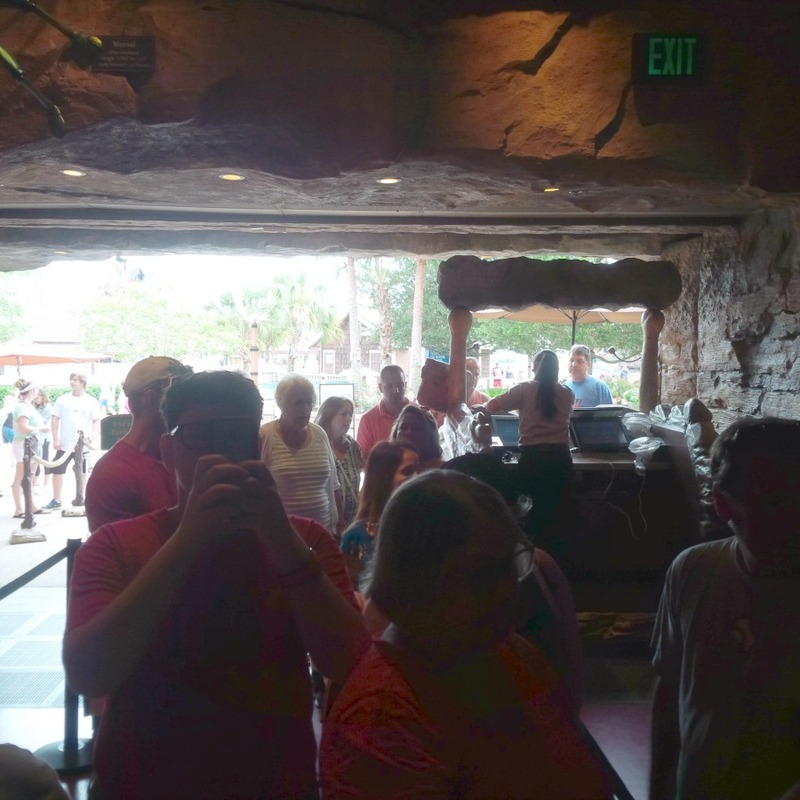 As we waited, we admired the Lava Lounge. It was decorated as a huge aquarium. It was actually kind of neat and we knew that if we wanted to, we could sit at the bar immediately but we continued to wait for a table in the main dining room . It was our first time here so we wanted to get the full experience. We waited and waited and then one of the hosts told us they were just waiting for a server. 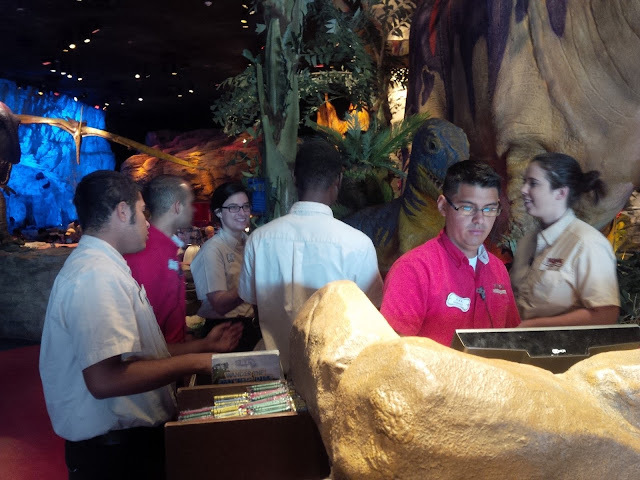 However, during the time we waited there were quite a variety of servers and managers mingling around the hostess station. In this picture there are only 6 people but at one point there were 9 people mingling around and yet no one in the line was being seated. I know this is a bad picture but I wanted to show how the line had grown since we started waiting. I could understand the long wait if they were busy but seeing very few people seated and seeing all the employees standing in one place confused me. I did not warrant the wait time we were experiencing. Eventually our server came to get us and escorted us to a table. While she was leading us she asked "So, what brings you here"? I guess by this time I wasn't really into casual banter so I thought it was such a silly question . I told her Vacation, and thought, isn't that why most people are here? I should mention that T-Rex is located at Disney Springs (formally known as Downtown Disney). 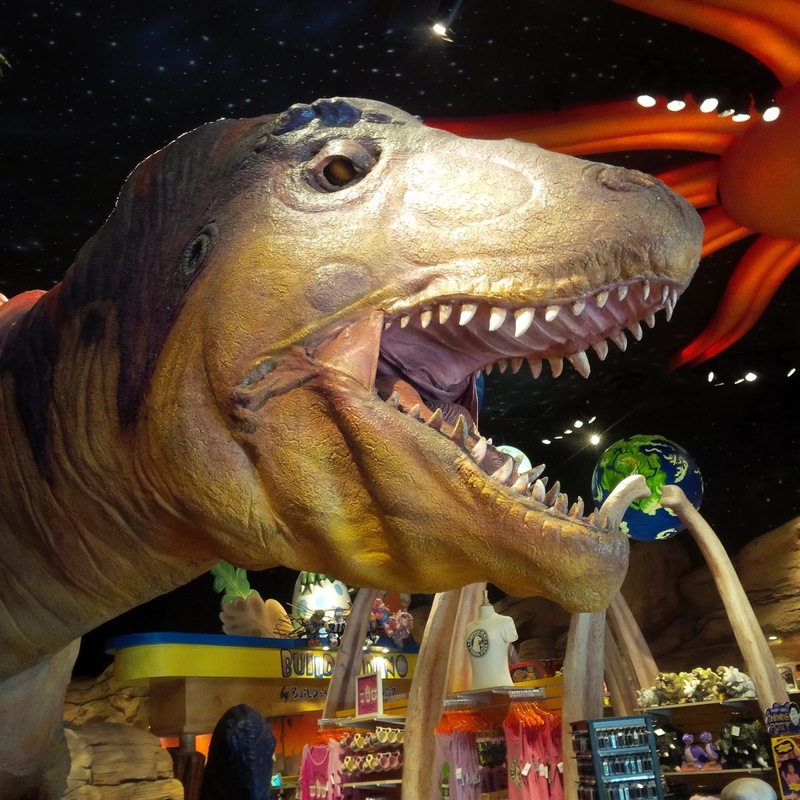 Like Rain Forest Cafe, T-Rex has animatronics and every 20 minutes there is a meteor shower in the sky. It also had a gift shop. I was actually quite pleased with the menu. There were quite a few options that I would have enjoyed. I chose the Triassic Trio (which was steak, shrimp skewers with veggies and rice and shrimp and scallops). It was yummy! Scott got the Korean Stir Fry Chicken which he quickly regretted. He said it was too spicy, which surprised me because he usually likes spicy things. Besides the long wait, I thought this restaurant had a fun atmosphere and I thought the food was very good. I'm glad we gave it a try. Tell me some fun themed restaurants you've visited. This seems so similar to Rainforest Cafe! When the boys were little there was a spaceship themed restaurant at a mall here--it didn't last very long, which is a shame because they just loved it! Yes, it's very similar. They are owned by the same company. 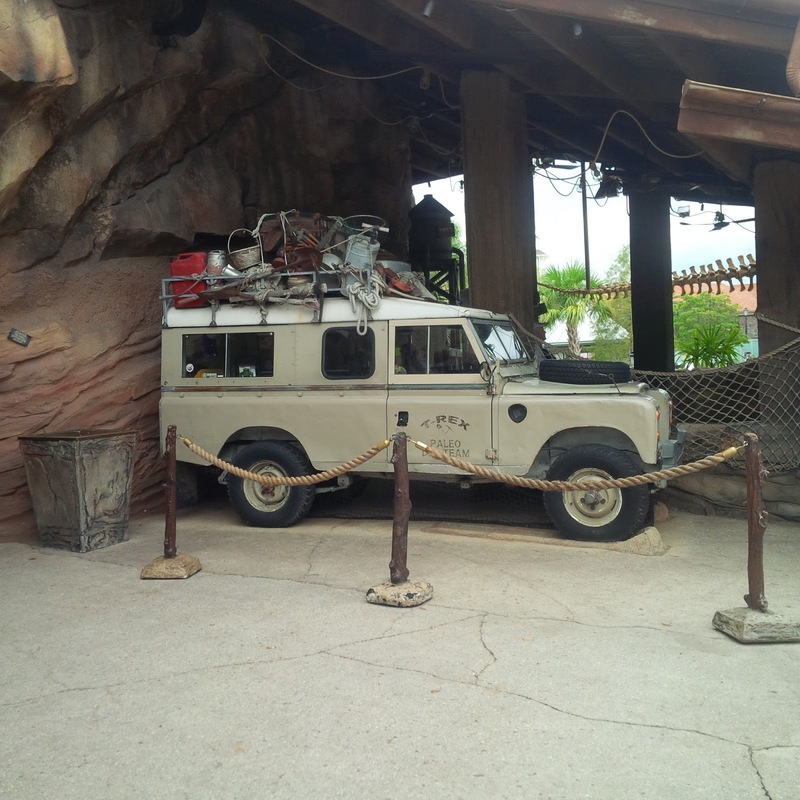 LOL, I was going to say the most memorable thing about Rainforest is the wait, but then I saw you beat the crowds -- but you still didn't beat the wait! It's really annoying when people seem to be standing around! Yes, I didn't understand what the wait was all about. We went to Rainforest earlier in the week and didn't have to wait at all. There are so many good ones in Orlando! Sounds like an interesting place but bummer about the long wait! We haven't been to any big themed restaurants with our kids. You'll have to put that on your list. The kids will love it. The Triassic trio sounds yummy!! 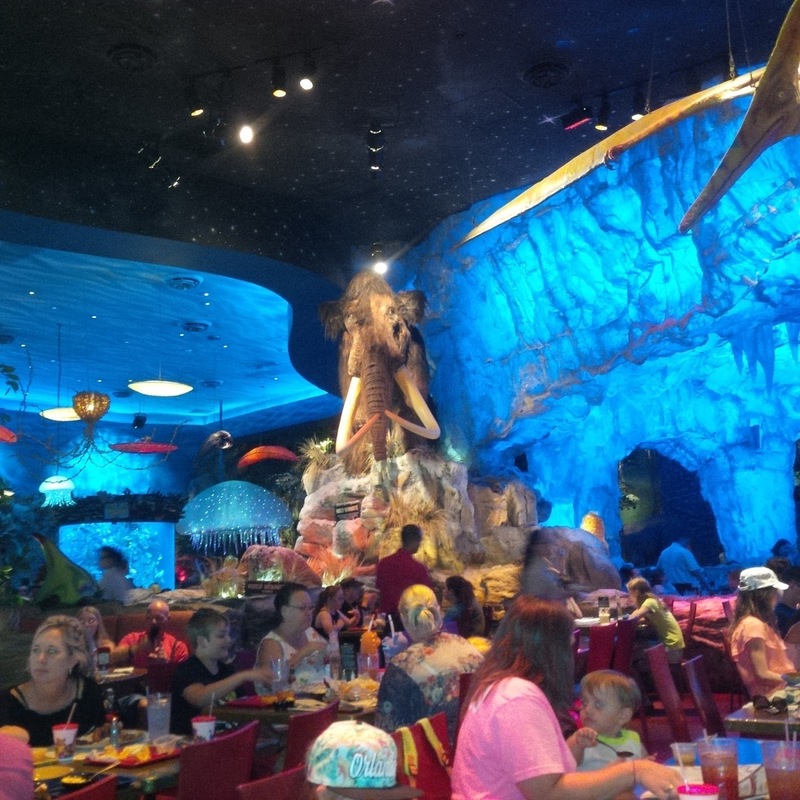 I've been to rainforest cafe, but other than that, I'm not sure I've been to a themed restaurant. Probably at some point but it's not surfacing. My husband definitely would not have been happy with the wait! I felt bad for scott because not only did he have to wait but he didn't really care for his meal. He admitted that was his fault though for ordering it. This looks SO cool! 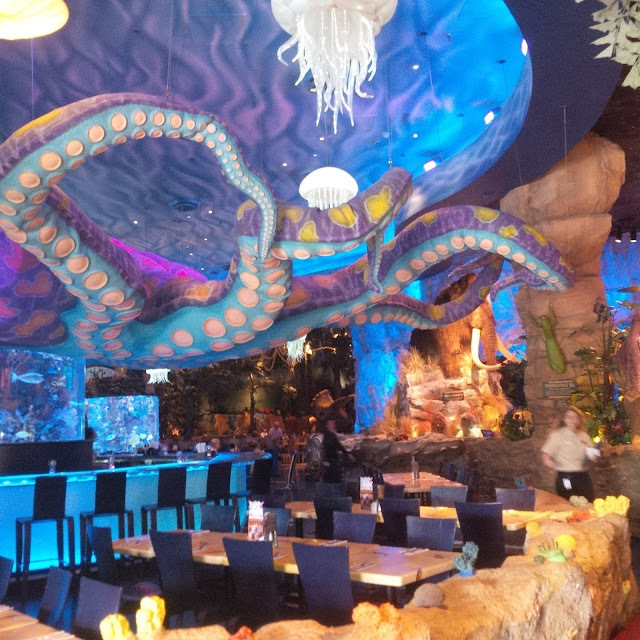 i love theme restaurants that are fun and this one definitely falls into that category. It sure does! You would like this one. I love the look of it and theme, but I would have been so annoyed by that wait :( I've never been to this restaurant but it looks like it would be fun. You should check it out during wine n dine. My grand sons would LOVE that. Yes he would! Has he ever been to the Rainforest cafe in nashville? We haven't tried TRex yet because we are waiting for Brayden to get a little older… I know he will love it! So sorry for your long wait at the beginning. I'm glad that didn't put a damper on the entire experience for you guys! This looks like so much fun! Although I would have been really irritated by the wait as well especially with all the staff just standing around - I can never understand that. One of my favorite Disney theme restaurants is the bistro inside Pirates of the Caribbean at Disneyland. I grew up in southern CA so we took many trips to Disneyland and I always watched the people at the restaurant at the start of the ride, then I finally got to eat there a few years ago - We had a reservation but did choose to wait an extra 20 minutes for a table on the water - It was so neat! How did I not know about the bistro inside Pirates? That sounds fun! I hate when at a restaurant they keep people waiting because they need wait staff.... and there is lots of wait staff walking around just socializing ... I just don't get it! I can't think of a single themed restaurant that I have been to recently.... I need more adventures. Hmmm, i'll need to find a themed restaurant for this fall! Most of the themed restaurants I've been too have been in Orlando, either at Disney or Universal. I haven't really eaten at Disney Springs, but Universal Orlando has some good choices. Yea, I bet a majority of themed restaurants are in that area! My favorite restaurant to eat at when we're visiting a touristy place is the Hard Rock Cafe. I love seeing all the memorabilia and collecting the shot glasses with the logo and city. We took my nephews here and they loved it!